Throughout the United States, the legalization of marijuana is being debated by the public and in government forums. Although still criminalized at the federal level, decriminalization at the state level has received national attention because several states have enacted marijuana legislation for medical and recreational purposes. As of 2013, 18 states and the District of Columbia have passed legislation allowing for the use of medical marijuana, which includes many edible products, and sales are projected to more than double by 2015. More recently, Washington and Colorado have decriminalized small amounts of recreational marijuana. In a study from Annals of Emergency Medicine, Dr. Wang and colleagues compared trends in unintentional marijuana exposures to children up to the age of 9 as measured by call volumes that were reported to U.S. poison centers. The authors hypothesized that decriminalized and transitional states would experience greater increases in call volume and have more symptomatic exposures and healthcare admissions than non-legal states. “States that decriminalized marijuana had significant increases in the number of children requiring medical interventions, but the overall number of unintentional marijuana exposures among children was low,” says Dr. Wang. More patients were evaluated in a healthcare facility in decriminalized states compared with non-legal states. 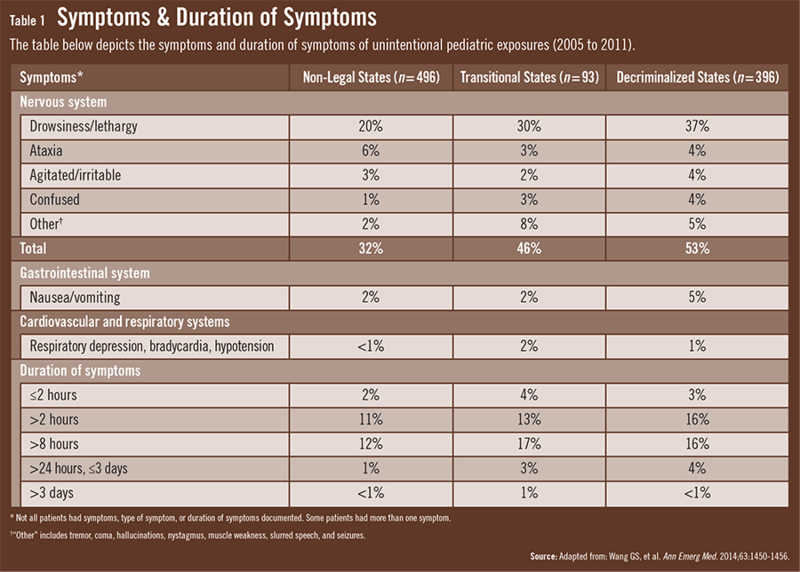 The symptoms that pediatric patients experienced varied, but neurologic effects were most common. The majority of patients had clinical effects lasting fewer than 24 hours (Table 1), and ingestion was the most common route of exposure. The study also found that patients evaluated in decriminalized states were more likely to have major or moderate effects and be admitted to critical care units when compared with those in non-legal states (Table 2). Most patients treated in a healthcare facility were eventually discharged from the ED, and many who were exposed to marijuana did not have documentation of receiving therapeutic interventions. Overall, the most common treatment was IV fluids. The study authors found that aggressive interventions were rare, and no deaths were reported in the analysis. According to Dr. Wang, ongoing surveillance is crucial in assessing the effect of the marijuana industry on children and evaluating preventive efforts as it continues to expand. 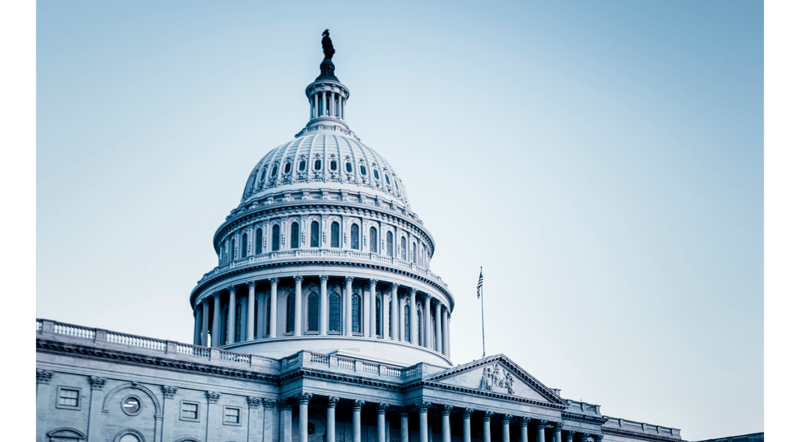 “Emergency physicians, toxicologists, and others should advocate for the safety of children to lawmakers as the marijuana industry grows across the U.S.,” he says. “As more states decriminalize the drug, lawmakers should be encouraged to create protective requirements to reduce the likelihood of ingestion by young children.” He says that child-resistant packaging, warning labels, and public education about these products when drafting marijuana legislation may prove to be valuable interventions. Wang GS, Roosevelt G, Le Lait MC, et al. Association of unintentional pediatric exposures with decriminalization of marijuana in the United States. Ann Emerg Med. 2014;63:1450-1456. Available at: http://www.annemergmed.com/webfiles/images/journals/ymem/YMEM5801_proof.pdf. Wang GS, Roosevelt G, Heard K. Pediatric marijuana exposures in a medical marijuana state. JAMA Pediatrics. 2013;167:630-633. Joffe A, Yancy WS. Legalization of marijuana: potential impact on youth. Pediatrics. 2004;133:e632-e638. Thurstone C, Lieberman SA, Schmiege SJ. Medical marijuana diversion and associated problems in adolescent substance treatment. Drug Alcohol Depend. 2011;118:489-492. Cerda M, Wall M, Keyes KM, et al. Medical marijuana laws in 50 dates: investigating the relationship between state legalization of medical marijuana and marijuana use, abuse and dependence. Drug Alcohol Depend. 2012;120:22-27. George S. Wang, MD, FAAP, has indicated to Physician’s Weekly that he has or has had no financial interests to report.